Many years ago, an ancient civilization ruled Earth. They had a very advanced technology, but were destroyed in the end due to the misuse of their creations. These people left messages for later generations in the form of indestructible message plates written in an ancient language. 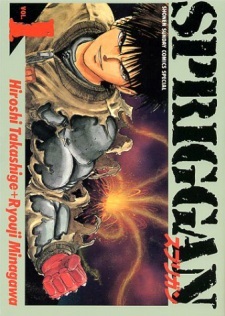 Spriggan had three volumes published in English as Striker by VIZ Media from November 5, 1995 to May 6, 1999. This release was heavily edited in an attempt to mask anti-American sentiments. It also ran in the monthly anthology magazine Manga Vizion from June 1997 to February 1998.